Ben Bingham, owner of Underground Hound, wanted to groom dogs and own his own business. Through that success, he has been able to help dogs who are a little down on their luck. He works with several rescues offering dog grooming before they go to the vet and while they are being fostered. He’s now working on his pilot’s license and hopes to start a non-profit offering to transport rescue dogs. WARSAW — Ben Bingham considers himself a lucky man. He has been able to take what he loves to do, to help dogs, and the community. He’s been a dog groomer for seven years, first in Fort Wayne, and now in Warsaw. He also recently expanded into Columbia City. “I waned to be a groomer and work by myself,” he said. That lasted four months when he received so much work he had to hire another groomer and move into a larger space. Six months later he expanded again. But he also puts his grooming skills to work in another capacity, doing charity work for the One Dog At A Time, a local dog rescue that puts dogs into foster homes rather than in a shelter, the Animal Welfare League of Kosciusko County and for Greyhound Rescue. He also works with Rudy’s Dog Park. One Dog At A Time will bring in dogs in before they see a veterinarian. Usually it’s a last minute call because the dog has a flea issue, is heavily matted or smells bad. “Usually here (his shop) is the first step before they go to the vet,” he said. “Usually there are skin issues the vet wouldn’t see if not groomed. You never know what you’re going to see. It is pretty gross, but it’s very rewarding because you’re part of the (dog’s) transformation. Bingham himself is a failed foster. While he already had three dogs: Janis, a 14-year-old miniature schnauzer; Chloe, a 4-year-old Bichon and Kali, a 1 1/2 year old Bichon, he agreed to foster Gracie, an 8-year-old schnauzer mix who was pulled from a puppy mill situation. Gracie had some medical issues at the time. Those who foster dogs for One Dog At A Time, can bring them to Bingham for grooming for free. “A lot of the dogs, we’ll see them three or four times before they’re adopted,” Bingham said. In addition to helping dogs who have lost their home find a new one, Bingham also allows local canine officers use of his facilities for their canine partners. Bingham is on a new canine centered venture. He’s already pursuing his pilot’s license and plans to start a non-profit providing transport assistance for rescues needing to move dogs. He explained most rescues tend to move dogs by car, which can take many volunteers and many hours. “I love to fly and I can turn that into something beneficial,” he said. 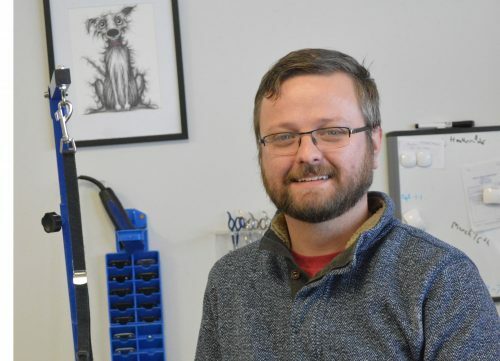 In the meantime, Bingham hopes to partner with the Whitley County ASPCA, offering it his grooming services to its dogs now that his new location is open.